The Mitsubishi is notorious for being a fun, sporty, fast drive! With an impressive 291 horsepower coming from a turbocharged engine, there’s nothing holding you back when cruising in the sleek, dynamic 2015 Mitsubishi Lancer Evolution. This car was born to drive with its precise all-wheel control, super responsive handling, and premium BREMBO® Braking System! 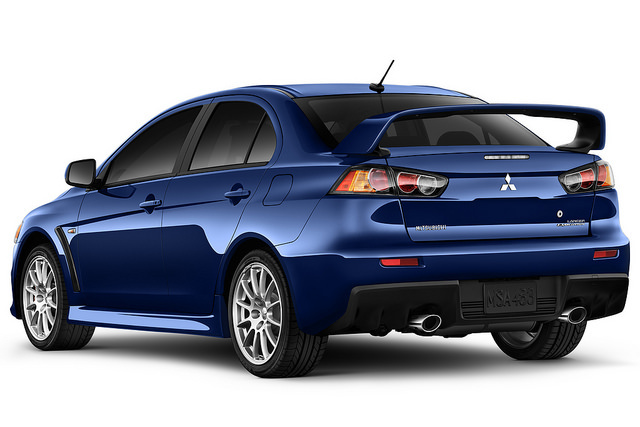 Stop into Carriage Mitsubishi and take an exhilarating ride in the legendary 2015 Mitsubishi Lancer Evolution today! The 2015 Mitsubishi Lancer Evolution operates on a powerful 2.0L MIVEC DOHC 16-valve inline 4-cylinder turbocharged/intercooled engine generating 291 horsepower and 300 lb-ft of torque. The dominant Mitsubishi Lancer EVO GSR achieves 23 mpg highway and 17 mpg city*, while the MR gets up to 22 mpg highway and 19 mpg city*. The 2015 Mitsubishi Lancer Evolution loves the thrill of the race! The 2015 Lancer Evolution GSR comes with amazing standard exterior features including: auto-off halogen headlights, fog lights, high mount rear stop light, rear combination taillights, aluminum roof panel, aluminum front fenders with air outlets, aluminum hood with heat extractor vents, large rear spoiler, large side airdam, heated power side-view mirrors with turn indicators, front grille with black mesh, dual exhaust finishers, rear window defroster with timer, and a green laminated windshield. Step the game up a even more with the Lancer EVO MR, which comes with additional exterior features such as: bi-xenon High Intensity Discharge (HID) headlights with auto-off function, Daytime Running Lights (combined with HID), rear lip spoiler, color-keyed hood and fender vents, chrome bezel accent, chrome beltline accents, and rain-sensing windshield wipers. The 2015 Mitsubishi Lancer Evolution’s interior is just as intimidating as its exterior! Some standard interior features include: a 6.1” touch panel display audio system, AM/FM/CD/MP3 audio system with 6-speakers, SiriusXM® Satellite Radio with 3-months pre-paid subscription, Digital HD Radio®, FUSE Hands-free Link System® with Bluetooth® technology, USB port, and steering wheel controls, steering wheel-mounted cruise and audio controls, keyless entry with panic alarm feature, color LCD multi-information display, high-contrast speedometer/tachometer gauge cluster, key cylinder illumination, automatic climate control, leather-wrapped steering wheel with silver accent, leather-wrapped shift knob, and aluminum sport pedals. Some of the standard safety features on the 2015 Mitsubishi Lancer Evolution include: Sport Anti-lock Braking System (ABS) with Electronic Brakeforce Distribution (EBD), BREMBO® high performance braking system, Active Stability Control (ASC), Traction Control Logic (TCL), Tire Pressure Monitoring System (TPMS), 7 standard airbags including driver’s knee airbag, front seat-mounted side airbags, advanced dual-stage front airbags with occupant seat position sensors, 3-point seatbelts and head restraints for all seating positions, LATCH system for children and child safety locks, an anti-theft security alarm system and engine immobilizer, and a trunk entrapment release handle. Be sure to stop into Carriage Mitsubishi and cruise around in the all-new 2015 Mitsubishi Lancer Evolution today! With our large inventory, our team here at Carriage Mitsubishi loves helping our customers find the perfect new car or used car for them! Please feel free to contact us if you have any questions or would like to schedule a test drive!